Supersoldat - Now Open Source! Supersoldat is a "character driven" platform game - it's all about the cool things the character can do, and he can do a lot of cool things. The game is unconventional as platform games go because you have extremely limited control of your character's movement while he is airborne - in this sense it is similar to Prince of Persia or the Abe games: to jump you need a run up - likewise for a flying kick to be effective, you need to be flying! In the tradition of Another World, Prince of Persia and the Abe series, there is a reasonable amount of violence in this game, albeit 16x16 pixel violence. -Save-points, title screen, buttons, key cards and doors to crush enemies with! -Realistic swimming: crawl, tread-water, frog-kick, etc! Head over to the game's new homepage for a download link. Supersoldat is made almost entirely using Drag and Drop - I've now switched to other projects in full GML (far less messy) so I've released the source code: you can find the new topic on the Open Source Forum! Edited by Wilbo, 20 June 2010 - 11:53 AM. Supersoldat: My first and most complete game - DnD only and now open source! Abomination: My current project - harder, faster, better looking but totally ignored by the community at large. Check it out, I need feedback! Post made on older version. A tip. Most poeple wont download games without screen shots. 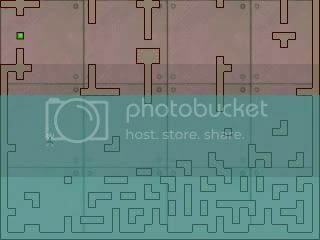 There's a DnD screenshot funtion I use, and just save them and upload them to some place like PhotoBucket.com. I'm downloading it, and will edit my review in later. Tip #2: Make a .zip too. Many people do not have WinRar, or a .rar extracting program. Edited by Cocopuffs, 12 July 2006 - 06:32 AM. Interesting Plot. Ill add more after i play it. Is it a function to not be able to jump and then move in a direction in mid air. Most platformers allow you to jump and then start moving left or right. But in your game you have to start moving in a direction and then jump in order to jump in the direction you want to jump in. I just didnt know if that was a function or an error in coding/programming. Looks good, but could still use some work. But it is in the WIP section so that is expected XD. Edited by Euko_Kyone, 02 April 2006 - 01:22 AM. I don't have winzip, so mabye I should just upload the folder without compacting it. I only rared it so I could send it to friends by email (you can't send exe files directly). This game is not a classic platform game, it is more similar to Abe's Odyssey or Prince of Persia (though these use a grid). I might concede to a very small amount of control in the air, but it will be minimal. The fact that you need to run-up is pretty much the basis for the whole game system. Normally you would use the jump-to functon to jump the character to the next position if there isn't a collision at this position. It was actually very difficult to set it up the way I did, using hspeed (it would be far simpler to do it the classic platform-game way), so I am hesitant to change it too much. I'm not sure what you mean by variable jumping. Is that variation in sprites, or jumping height? I did almost all the graphics myself, which explains why the movement is a bit shaky. I'm not great with frame by frame animation, especially walking, and most of the animations are only a few frames long (as a matter of fact, the only animated sprites I can think of are the walk and the melt animations, the others are single frames). I will go back and edit the original post to hopefully add screenshots. As for what this game is, I'm not really sure. I wanted to make a 2D puzzle realtime game, like Lode-runner (grab the gold, avoid the enemmies) but have many different types of enemmies like in Abe's Odyssey (enemmies that fire, that charge you down, that drop bombs on you, etc). It also has some shooter elements (think Soldat, without the aiming - how do you make the guns follow the mouse!?). Then put all sort of stuff I think is cool, for example skidding or being knocked flying and/or melting, into the game. As promised, I've created a title screen for the game. You can now start a new game, load your last save or exit the game using up/down and enter. I know there are only two levels and one checkpoint at the moment but this will come in handy if you need to leave the game and return to your save later. If you die having not saved in the current game, you are returned to the game menu (rather than the save that you may have created last time). Finally, you can press escape at any time to return to the game menu. This may not seem like much but it certainly adds somthing to the game. I think I will also seperate the game into episodes so that you can start a new game from without redoing everything (in case you mess up your savegame - saving next to an enemy for example, though I will try to place the checkpoints so that this rarely happens). Edited by Wilbo, 02 April 2006 - 07:20 AM. The link is down, fix it so i can download. Edited by hpapillon, 02 April 2006 - 01:39 PM. What I meant by the movement was that you have to be moving in a direction and then jump to make a diagonal jump. Most games like yours allow for the movement after jumping so that you can jump and then move left while in mid air for example. Thats why i was wondering if it was a feature or not. Overall though the game is pretty good. Odd....i get 404'd if you upload it to a different upload site, ill download it and feed you my yummy comments? Okay, so I'm guessing that generally we need a new link (possibly a different site) with no RARification (I don't have winzip I'm afraid, so I won't compact it at all). You are not supposed to be able to control the movement while in the air. This was done on purpose more to change the way the game is played than to make it more realistic. As aformentioned, I may be giving you a small amount of control while in the air, but not being able to control your flight is basically the whole idea of the game. I'm wondering how you organise those version numbers for the file history. It looks really professional but I only just started doing it. Is there a system (small amount of change = 0.01; big change = 0.1; new game = 1)? I'm just running out of numbers left before I get to version 3. Mabye I should start again at 1. And seeing as the game isn't even finished yet, should I just put <1? okay, got the new version (lets call it 2.9 for now). Done some basic crouching and added the title menu. The only compacter I have is winRAR and I can only upload one file at a time, so this second version is just and exe file. To get the readme press F1. Edited by Wilbo, 03 April 2006 - 07:59 AM. I like the graphics from the guys but not from the tiles. make it a jungle of something like that, it will look much nicer. The jumping system is not so smooth too. Make it smoother and you have a very cool game. Hmmm, the idea was to was it in a bunker or some kind of dungeon style place, crazy german professors and their henchmen might be a bit out of place in a jungle. I'll admit I'm not great at the apearance element, I concentrate more on function, so the decor is rather bland and uninteresting. I'll try to make some scenery at some point. I think to help with movement I need to make the player able to walk as well as run. I was going to use shift as the run key and alt to throw grenades, but alt seems to pause the game, and I can't figure out how to turn this off (unlike Esc and F5/F6 for example). I also need to add the ladders. Jumping is supposed to be used mainly for leaping gaps while ladders will be used to go up/down. This is why the jumping doesn't work very smoothly (I assume that's what you mean). I love it, every part of it. Don't add guns, that would ruin it. Every time I play I get a huge grin across my face, I love the way the little dudes run and get burned in acid. The AI is really good, they jump across the platforms perfectly. I still haven't passed the first level, but I don't care, it's still fun. Thanks greatly for the vote of confidence! I've just finished the crouching system. You can now commando roll if you are travelling fast enough when you crouch, and can knock over enemies by rolling into them. Also fixed a few bugs in the crouching (caused by situations not encountered in the current 2 levels) and the Einsteins will now bounce off walls properly. Next I need to work on the ladders, and give the AI an overhaul: Einsteins will throw from a crouch, to stop crouching making you invincible to missiles (they will crouch if you are crouched, so you need to time it). oops... meant to edit my post but quoted instead. I can't seem to delete this. anyway, the readme can once again be access by pressing F1 (now pauses the game so you don't die). Edited by Wilbo, 04 April 2006 - 11:06 AM. Don't add guns, i mean, for the player. Edited by Tobias(NL), 04 April 2006 - 12:15 PM. Well no have guns. It's more fun that way. U can add a stealth elemnt if U want but keep guns. Solid Snake and Splinter Cell had guns. What kind of soldier or should I say Soldat uses no gun? Soldat is definitely soldier in Russian, but is it also Soldier in Polish? Cuz the game Soldat is by a polish guy I think. But keep it archived. I have slow internet and I hate it when ppl keep their games not zipped. If you're using winrar it's easy to make it be a zip file. When U right-click and say add to archive it gives U all these options, and you can make it have maximum compression and a zip file instead of a rar file, although rar files do compress much better. OK its done DLing so I can reply to the actual game now. Well it's kinda cool. I see U have music from Doom. I'm thinking it would B a good idea to have original music although in one of the games I made it was all from Doom which was stupid of me. Maybe have it so U dont die in one hit. have it so U have Health. And serously the jumping is too hard to control. I kept dying at the bottom of level 1 like the whole time cuz I made the guy jump too soon or somehintg and wnated to go back but couldn't. And try to add a tiny bit of shading to the sprites so the look better. They have things that are like 2 pixels wide so U can shade that. I know its hard 2 make such small sprites though. And try to make the scientists not run into a wall back and forth if U are standing right next to em and theyre near a wall. Maybe make them jump over U when they run away or something. And make them stop running away if theyere far enough and make them throw acid at U again. Also maybe make their aim a bit better just to mkae the AI a bit harder. And have like Kicking and Pucnhcing buttons or something so U can make combos, although U do have differnt moves U can do depending on what U do while attacking so that's cool. HOLY **** that was a long reply! Well OK. I'm done. Edited by Potnop, 04 April 2006 - 12:58 PM. wow.... that's a lot of Us. Soldat is soldier in german. The game has a sort of german theme (Wolfenstein) so I thought it was appropriate. Many people have complained about the jumping. I maintain it just takes a little time and practice to get the hang of. It is different from most games of this genre, but then again that is the whole idea. Rebounding is also difficult to master, and it is the only way to get to higher positions at the moment. I am planning on changing the AI a bit. I want to make the enemmies see you only if they are facing you and if there is nothing in the way. This will add a stealth element to the game (for more difficult enemies). The Einstein enemies will also crouch to throw acid at you if you are already crouching. I'll admit the Einsteins repeatedly running into walls is a problem, but I'm yet to figure out how to solve this without drastically changing the whole AI system. Another problem would be the Einsteins occaisionally not returning to their patrol route after they have been frightened. This game is not a fighting game at base, and I have enough attack sprites as it is, without adding combos. Also there are limited buttons at my disposal: most games use space, enter, arrows, ctrl, shift and alt (the last three being in two places, depending on how you put your hands on the keys). I can't use alt, as this pauses the game (you can't turn this function off) otherwise I would be using alt for grenades and shift for running/walking. I am not adding health either for the same reason. This is a puzzle(ish) game and doesn't allow for more than one accident. Finally, I am yet to really settle on music, but I don't think I will be able to have fully original music. It has to come from somewhere (I'm not going to compose my own I'm afraid). I've fixed the commando rolling version's hyperlink. Check it out! Edited by Wilbo, 04 April 2006 - 10:24 PM. I like where this game is going. Combos are too confusing, I agree with you, leave them out. The jumping is perfect. I really like the small amount of keys used, much better than certain games with a key for every single action ever. I find I can usually get exactly what I need done easily and quickly with the current control setup. I'm still against guns in this game, but if you must then add them. Well, I'll keep checking up on this topic from time to time for updates. Well OK. I still think jumping should be easier somehow. Maybe at least don't make the beginning have a gap that U fall into so U get more practice as U move along. Because as a beginner, I keep falling in all the time. And to fix the einsteins running into walls, I kinda thought of a way to fix it. I think I either did or was gonna use it to make the AI in one of my old games run away from grenades. Obviously if they kept running into a wall theyd look very stupid and would simply die. So what I did is I had them run the opposite way from the grenade if there was no wall in the way. If they encounter a wall or somehting, they turn around and go at the grenade. Once past it again they do normal evasion. THat still kinda looks stupid but at elast they dont die as easily. I guess for a grenade now I could have em jump over it, or better yet calculate ahead of time that the wall is gonna B in the way. So the einsteins could like jump over U as they run toward U.
improve the movement : its a little buggy to me, sometimes i though i am a ball whos bouncing against walls..
Einsteins begin to run away from the player if you are within a short range and on the same level, and will continue to run away as long as you are on the same level (range doesn't matter after they being running). They will throw grenades if you are close enough, but not too close for them to run away. They will stop running but stay "spooked" for a while even when you jump to another platform (though somtimes they stay spooked permanently... I'm still trying to work out why). Anyway, they are being given the "run-away" order ever step so long as you are in the right place, so changing this would involve pretty much changing their entire AI system (I had one idea to make them run into walls and knock themselves out/play dead, but this makes them even easier) which I need to do anyway, but will take some time and effort. The system was lifted from the Igor AI system, only since they are running toward you and not away, you never have problems with Igors running into walls. If scientists could kill Igors, it would be more realistic certainly, but not neccesarily more fun. For example, when you throw acid, the bottle is bigger and has an area explosion that kills everything (including you if you're too close it it) in the vicinity. Giving these big bottles to Einsteins made the game extremely difficult, not to mension the fact that they often killed themselves and their minions by accident, so I gave the Einsteins smaller vials that only kill you if they hit. For the same reason, the vials cannot kill other Einsteins or Igors. They aren't aiming for their allies so why should they be hit? Sure, it would be cool if the bottle (when dodged) hit the guy running after you, but what if the Einstein threw a bottle at you and hit the bodyguard right infront of him. This is what I called artifical stupidity. 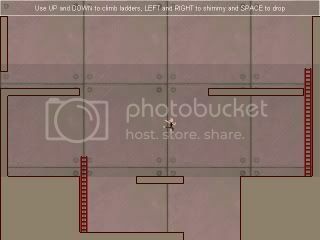 Finished ladders, adding some more levels at the beginning so that you can get some practice. I've added fall damage and a few other features, which should be in the next update. I'm now beginning to redo the AI (before moving on to more complicated enemy types/bosses). Are there any comments on crouching/rolling and climbing? A number of people have downloaded the most recent update (according to the site) so what do you think? The new AI system is taking a lot longer than I thought it would, so I'm going to release what I have done since the last update, minus the new AI (at the moment, nothing works, so it's better off without out it... for now). This new version includes more nifty crouch-related moves (for example, jumping higher if you jump when crouching, or further if you jump while rolling), fall damage, or should I say death, full-screen mode and a few other things I can't remember (I did this all a while ago, and have been working on the AI since). Anyway, I hope to get the AI finished soon enough (I've made a "cower" sprite for the Einstein, for when they are cornered). Well you could make the scientists check if tehir allies are in front and if they are in the vicinity of where the vial would explode. But I guess you're right, it works that way kinda alright. Nice engine you got there.! Fantastic! I love the way you bounce off the walls and how the enemies go flying when you punch them. It's a bit difficult though, but keep up the good work. edit: I geuss its not like that just a common name Nice origonal images and stuff! its all cool im playing it now! Edited by Game Maker Freako, 13 April 2006 - 11:16 PM. I know the game can be hard to get the hand of, especially seeing as it doesn't use the generic control system. I suppose I've had so much practice (testing the game as I make it) that I sometimes forget that. Soldat just means soldier in german. I decided to call it Supersoldat simply because it sounds cooler than Super Soldier. Basically, it wasn't anything to do with the original "Soldat". Right, I'll upload a mirror on another site. Do you have any suggestions? I've used iHud once or twice but it can be very unrealiable. [EDIT] Okay, I've uploaded the file on iHud in case you can't download it off the other site. Hope it'll work for you. Edited by Wilbo, 14 April 2006 - 12:18 AM. This game is so great I made a sig! This is really fun! hard though... add a story intro thingy! Yes, I need to do an intro, but at the moment the levels I have given you are more like a test or showcase for features. When I've got everything working the way it should I'll begin to make the game properly (there will be more of a point and purpose to it, at the moment it's just running out beating people up) and I'll make a starting cinematic. 1 - You've chosen to put my game on your signature as opposed to anyone else's (and this is my first game). 2 - It's possible to screen-capture sprites! I've made an animated Avatar using a sort of montage of sprites, but I can't seem to upload it directly from the hard-disk, and I'm not sure how to upload the image as an image (as opposed to a file that you can dowload and look at). Mabye if I figure out how I can put some screenshots on the thread. Edited by Wilbo, 14 April 2006 - 12:48 AM. Lol 1. SWEET! ONLY FIRST GAME? this was really fun, i like the jumping a lot. plus there are a lot of neat attacks, and the ai is fairly good. Loop? You mean like this? Ill use it as my avatar too! it is really kool. again dont add guns. the wall kick u need to use on the last level to get high enough is hard to do. he needs to be able to grab onto ledges. other than that it is really fun. s(AINT), he should be able to grab onto ledges as the wall-jump bit on the last level was very hard to do. Finally made a breakthrough with the AI. I've put together a little test for it so I can show it off (I'm uploading it at the moment on iHud, so dimitri can download it). So far I've done up the AI for the Igors so that they are more easily alerted, but will only see you if they are facing the right way (they are also alert if a corpse falls on them, or if another enemy runs past them). Igors will now also climb ladders to catch you which makes them quite tricky to escape at times (Try surviving as long as you can without killing any). The Einstein AI, which is a lot more complicated, isn't done yet, so there aren't any Einsteins in this level. There is however a save-point and some acid to play with. Other simple stealth elements that I may be adding are shadows (time to try out sprite blending) and possible "sound" (eg: if you are jumping up and down to close to an enemy, they will "hear" you and turn around). Guard dogs will be able to "smell" you, and basically detect you no matter where you are hiding. I need to finish what I'm doing (the AI) though before I start somthing else. As for Game Maker Freako - how did you manage to get that sprite? I had so much trouble uploading it it's not funny. And how do you get it to loop like that anyway? I want the loop version! It's not funny anymore! Photobucket (whom I grudgingly registered with to upload the image) want me to buy something if I want to loop the image. Could you PM the link or somthing. I made the animation after all. I may have uploaded the wrong file (the backup) for the AI test. If so then the enemmies will not follow the player correctly (if you jump over them they won't turn around and follow you). If you notice this in the AI test then I will update it with the correct version (I might have uploaded the right one, but I might not). Another new version! I've fixed some problems with the AI added simple (and ugly) shadows that you can hide in and a stealth-kill move (crouch+attack un-alerted enemy from behind). If I do say so myself a pretty awesome animation. Another challenge for you: try to kill all the enemmies using stealth kills, without any of them seeing you (you have to use good timing and the shadows). Igors may be extremely simple to deal with, but I'm going to add in much harder enemmies at a later stage (that may only be killable with stealth). And to show you that I'm not asking the impossible, there is a save-game with all the Igors stealth killed (by me). (edit) By the way, I would really like some feedback on the new AI. As aforementioned I can't tell whether anyone's downloaded it, but I'm guessing people have, and if so, you need to tell me what you think. A lot of work went into that AI (and continues to go into it). Edited by Wilbo, 17 April 2006 - 12:17 AM. I'm now giving Guard Dogs a go. Their AI is very simple and I've finally managed to create some reasonable sprites for them (dog walk and run animations are very tricky). Guard Dogs are slightly slower than the player's maximum speed, unlike the player, don't need to accelerate, are very dangerous. They also jump up when the player is over them, but can't climb ladders (... duh). I've also improved the shadow system a tad (looks and works slightly better). I provide a demo so that I can get feedback, suggestions and constructive criticism on the game so far. The least you can do is to give me a thumbs up or down. It takes less time to post than it does to download. Expect a lot of people to not reply. Usually one in maybe twenty (or more, and this is just an estimate) people who download a game here actually reply, so with two pages, you're not doing too bad, even if a lot of the replies are your own. Constructive criticism? There's not all that much to construct on at the moment, what you have here is pretty good. Great fun to play. Going up ladders, however, I find fiendishly difficult because of the horizontal movement. Perhaps if you locked the player's x coordinates while he climbs? Also I've found that the AI use ladders every now and then when it would be easier to simply jump like in the old demos. The AI is fantastic though. I couldn't get the hiding in shadows to work, I trid ducking in them but when the AI bumped into me they killed me. The stealth kill was awesome, but it didn't seem to work that well, after the leap you sometimes just sort of sit there while the enemy plays though his death animation. Well, keep up the good work, and remember that not everyone will reply. Keep updating regardless and it will be recognised eventually. Sorry if I was a bit... exasperated? Hasty? I don't know. Anyway, I've been a bit of a hypocrite since I actually just now played your game (mechbot) and forgot to post myself (I must do this at once!). This level was special made for wall rebounding. You have to use it to reach the higher levels while in the rooms before it is just a tool you can use, but don't have to. To get to these areas you will have to get a run up and run towards the opposite wall, jump, and attack before you hit the wall (if you don't attack you will just get knocked down). This can take a bit of practice to get right. You may also need to leave the room to get extra run up for the one on the left, though there's plenty of room on the right. You can repeat this several other times throughout the level, I'll let you figure out where. Wall rebounding won't be used that often, probably just for secrets, shortcuts or really nasty levels. Shadows merely stop enemmies detecting you when you are in them. Enemmies will also only attack when they have detected you, so if you are in the shadows and they are not already chasing you, they can't kill you. The problem is that if they've already seen you, they will continue to move in the direction they last saw you and that will normally involve you getting killed. This system looked a bit stupid though (especially with the speedy guard dogs) because they would be charging after you one minute and then doing a slow patrol the next. In the version I am currently working on, I have changed this so that the enemmies will stop and stand still when they half their "alert" half full and then stop and return to patrol from there, which both works and looks better. I've used a different system for the AI and for the Player ladder climbing. For the Player I just checked whether there was a ladder at position (0,0) but for the AI this caused system problems as they would get on the ladder as soon as they reached the edge of it (and so go stuck on the bottom of the ledge above them). The natural solution would be to snap to the centre of the ladder, but with this function you can't identify the specific ladder (eg: "if there is a ladder at the position (x+0,y+0), snap to position of"... erm... ladder? which ladder?). Eventually I discovered that the collision event worked in practically the same way and you could use other. (x,y) to snap the enemy. I didn't change the Player ladder climbing because it seemed to work okay (though I agree it can be frustrating at times). So I've basically been a bit lazy about it. Still, I will try to fix the problem for the next release (somthing along the lines of: "if player is going up/down -> snap to centre of ladder" that way you can still get off where/when you want). Coming to think of it, I should do the same thing for buttons (I was wondering how to get the player to press a specific button - this will alow multiple buttons per room!). Your problem with the stealth kill is interesting, that's never happened to me in my tests, I've changed the stealth-kill since the last version and made it work better, though I don't remember it ever not working at all in any of the versions. I've got a few more two part animations (eg: involving 2 objects) coming up, including the guard dogs, which pin you down, drool on you and then eat your face! I've talked a lot about the dogs, and though I've nearly finished them, I haven't done any death animations for them (so you can't kill them by any means, not even with acid, which you will be able to do when they are finished). I also can't find a good dog death sound (depressed/ressigned whine + acid doesn't really work). So basically I have to finish the dogs and fix the ladder/button before the next version, but I'll release it when it's done. I'm doing this because I enjoy doing it anyway, not for the praise (though a little praise is nice). Edited by Wilbo, 18 April 2006 - 04:42 AM. -A lot of people don't seem to like the way the movement engine works, but I'm not trying to make your standard formuler platform game so there probably won't be arial movement, and if so it will be about 1/10th of what it is on the ground. You can't remove the murder from a murder mystery, and likewise the movement engin is basically the whole point of the game. -If you hit yourself with your own bombs, then that's your problem I'm afraid. That's the way the game is, and how I intended it to be. Take any shoot'em'up game you like and drop a grenade at your feet. What happens? -You have a good point for the bomb releasing though. This is what is called "constructive criticism" as it proposes a solution (as opposed to just plain criticism, which doesn't. I could critise democracy for example, but I certainly can't think of a better system, so there's no point). Anyway, I will turn off the automatic throw to make grenades a bit easier to aim. -"Try again" is just a little harsh, seeing as months of work have gone into this game. You don't expect me to just throw everything aside as if it was worthless surely (is this "destructive critism")? I'm glad you appreciate the animations though. There's a new version by the way. I've finished the guard dogs and their crude (but mostly effective) AI. I'm afraid the dogs are pretty difficult since they can't be killed with combat attack or stealth kills, only acid (tip: throw it at them when they are not right in front of you, preferably when their backs are turned). I'll fix up that first post.